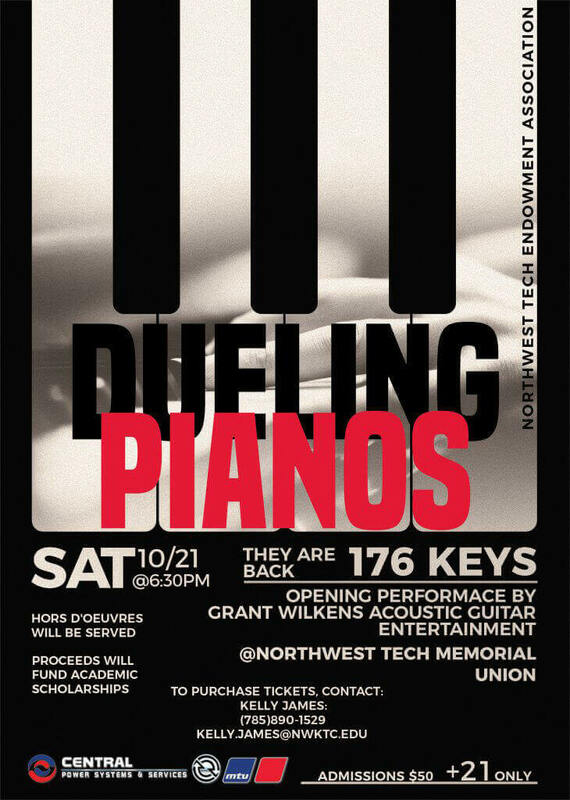 Northwest Tech will be hosting the 2nd annual Dueling Pianos endowment fundraising event. Dueling Pianos Kansas is a part of Fun Pianos by 176 Keys, traveling pianos show. Their veteran dueling pianos players have performed to great reviews for private and corporate parties, weddings, bars and clubs throughout Kansas. Dueling pianos is a request-driven mega-interaction show. More than just dueling pianos and sing-along…it’s audience interaction. Fun pianos Kansas has played in places such as Wichita, Hutchinson, Topeka, Salina, Kansas City, Garden City, Dodge City, Manhattan, Overland Park, Chanute and in Wichita. All funds generated by this event will go back directly to support student academic scholarships. Last year the event raised nearly $12,000 for scholarships and was such a hit that attendees requested the college bring it back! The night kicks off on Saturday, October 21st at 6:30PM in the NWKTC Student Union. Tickets will be sold at the door for $50, or you can contact Endowment Director Kelly James at (785) 8901529. Cash bar available.